The following screenshot displays the error. This error occurs due to the mismatching of DLL version referred in your sample, when the assemblies referred in the application and the .NET Framework version of the application are different. To resolve this issue, you need to refer the assembly DLL version that matches with the framework version used in the application. And also, all the assemblies referred inside the web.config file should match your .NET framework version. When you are using 13.4.0.53 and the frame work version is 4.6, then the DLL version should be 13.4460.0.53. Check the bin folder and refer the following table for DLL reference. Right-click on the sample and select “Open file in Explorer”. Inside the Project folder, you get the bin folder. Check the version of DLLs inside the bin folder. When the assemblies are referred from GAC reference, follow the provided steps. Open Solution Explorer in the application, click on References and get the Syncfusion.EJ and Syncfusion.EJ.Web assembly references. 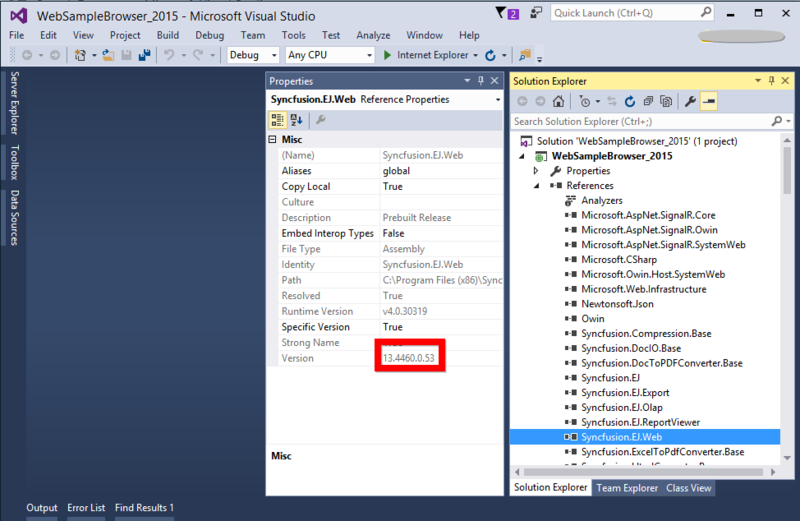 View the properties by right-clicking the Syncfusion.EJ.Web, inside references. Check the version of the assembly in the Properties tab.